Baking Recipes Bolu Zebra Soft Favors and Specials .Cake cake is serving snacks or treats for the guests who attended to your home or even as food in a relaxed moment with your family. Steamed sponge cake has many kinds and variations that look beautiful and attractive, one color that looks beautiful is steamed sponge cake zebra. 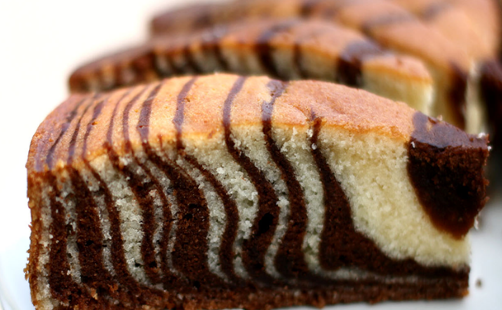 Steamed sponge cake zebra is a sponge cake that has a color and motif is beautiful and interesting and a smooth texture in ancient times until today, so many people are addicted to this cake with a sweet taste at all. Has a beautiful color and modifications that make a strong appeal to the general public. Well, for those of you who love to make a sponge cake recipe you can certainly say easy, because it makes the zebra sponge cake is not so difficult. In addition you can also be made ​​in the provision to the office or to school as a snack when there is time relaxing or taking a break. Well, already curious about the recipe right? Follow the way below correctly and carefully. Turn on the stove and heat the steam by using a medium heat, then take the pan and spread with margarine and sprinkle with flour when the dough in order to pour not sticky and stuck to the pan. Provide a container and mix sugar, cake emulsifier, eggs, whipped by using a mixer to be more fluffy and perfect adukannya. Add the vanilla powder, flour, baking powder, milk, margarine, stir again until the dough is soft, smooth and evenly mixed. Provide containers back then divide the dough into two parts, the input cocoa powder in the batter, stirring until well blended. Provide pan then pour the white dough into the middle of the pan, then stack the chocolate dough, flatten the dough should not in and when steamed dough will also flow to the edge of his own. Once in the lift please cut zebra sponge cake according to taste, enjoy while still warm. 0 Komentar Untuk "Baking Recipes Bolu Zebra Soft Favors and Specials"